D Reichner, G Evans. Tibial and Common Peroneal Nerve Compression in The Popliteal Fossa: A Case Report and Literature Review. The Internet Journal of Plastic Surgery. 2003 Volume 2 Number 1. This case report describes an uncommon compressive neuropathy involving both the common peroneal and tibial nerves as they pass through the popliteal fossa. The patient is a 16-year-old male who sustained a right knee fracture-dislocation. There was disruption of the popliteal artery, which was repaired with a reversed saphenous vein graft. This surgery was complicated by a postoperative hematoma. After drainage of the hematoma, the patient developed a progression neuropathy over the next 6 months that involved the common peroneal nerve and to a lesser extent the tibial nerve. Foot drop, muscle wasting of posterior and anteriolateral compartment and sensory loss over the dorsal foot and lateral leg were also documented. Based on the history, clinical finding and electrodiagnostic studies, the patient had both a tibial and common peroneal neuropathy. The neuropathy was related to the accident, but the exact etiology was unknown prior to surgical exploration. Surgical exploration was performed 15 months following the injury after referral to our institution and thick fibrous scar tissue was found compressing both tibial and common peroneal nerves. These bands were released and complete internal neurolysis was performed on both nerves. Although uncommon, surgical nerve compression can occur following extensive scarring secondary to trauma or surgical procedures. This discussion will describe the history of compressive neuropathies in the popliteal fossa. We will review the relevant literature and anatomy of this disease and describe disease progression and treatment options. Compressive neuropathies of the involving both the peroneal and tibial nerves are rare. This is a case report describing an uncommon compressive neuropathy involving both the common peroneal and tibial nerves as they pass through the popliteal fossa. A 16-year-old, previously healthy, male was involved in an off-road motorcycle accident in March of 1999. This resulted in a right leg tibial plateau fracture/dislocation with disruption of the popliteal artery. The artery was repaired with a reverse saphenous vein graft and the tibial fracture fixation was accomplished with percutaneous pins. The knee was immobilized with a long-leg knee-immobilizer for eight weeks. Post-operatively the patient developed progressive sensory loss and muscle wasting. One year following the accident, these finding progressed to severe prominent atrophy of right lower limb distal to the knee. Plantar flexion was present with minimal eversion of the ankle but no definite dorsiflexion. He also had limited passive motion of the right ankle at that time. These clinical findings where consistent with neuropathies of the tibial and common peroneal nerves. Nerve conduction and electromyography studies were performed 2, 5 and 13 months after the accident. The initial study at 2 months demonstrated fibrillation potentials in the right soleus and gastrocnemius in addition to peroneal muscle innervation. This is indicative of dennervation injury. This could have occurred despite having an intact nerve due to internal scarring or separation. 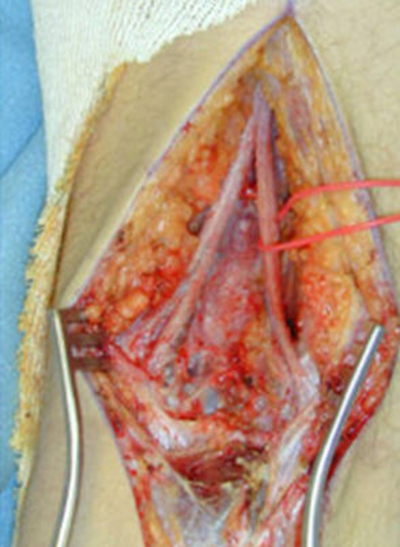 Five months following the accident, there was no significant denervation in the tibial-innervated muscles but the abnormalities continued in the peroneal-innervated muscles. Thirteen months after the accident and referral to our institution, nerve conduction studies documented severe right peroneal motor and sensory neuropathy. There was also less severe right tibial neuropathy with some reinnervation in the calf. The right sural sensory amplitude recorded at the ankle was normal and not significantly asymmetrical compared to the left. This suggests that the peroneal neuropathy and the tibial neuropathy were at a level distal to the branches of the sural nerve. This history suggests a progressive right peroneal and tibial neuropathy that became apparent after 5 months and was complete after a year. The nerve conductions studies also suggest a discrete nerve injury, one confined to the popliteal space below the level of the sensory branches of the tibial and peroneal nerves, within the area of the original injury. The patient was initially seen at our institution 15 months after the initial injury. At that time, the patient had significant muscle wasting of the right peroneus, tibialis anterior and dorsal foot. He also had sensory loss in the right lateral leg and on the dorsum of the foot. There were early signs of claw deformity of the right toes and foot drop. The decision whether or not to operated was based on the length of time since injury, the patient's age and the desire of the patient's parents to be more aggressive. It is conceivable that even with restoration of nerve continuity, muscle innervation might not have occurred due to the length of time muscle dennervation. Because of the patients age however and his desire for restoration of function, surgical exploration appears a viable option in this patient. Surgical exploration of the right tibial and common peroneal nerves was performed. A 20 cm incision was made which extend from between the biceps femoris and semitendinosus through the popliteal fossa and gently curving outward toward the lateral calf (Figure 1). The common peroneal and tibial nerves were identified just above the popliteal fossa and were carefully dissected distally. 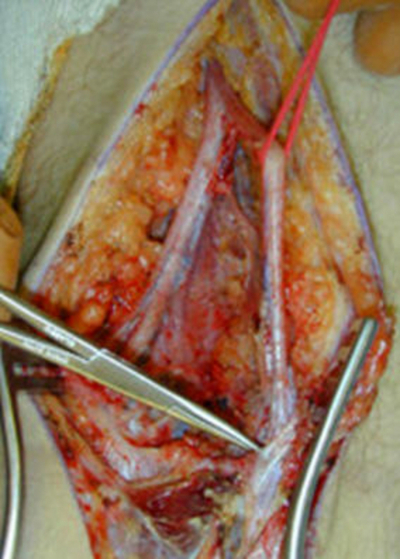 (Figure 2) Within the popliteal fossa both the tibial nerve and common peroneal nerve were found to be invested within a thicken band of scar tissue, visibly compressing the nerves (figure 3). These bands were released distally until the nerves had grossly normal appearance. There was no internal scarring or neuroma in continuity noted however internal neurolysis of the common peroneal and tibial nerves was also performed in these same areas. (Figure 4) The wound was then closed without drains. Within weeks following surgery the patient complain of dysesthesias in the right lower extremity. He was discharged home and at 6 months follow-up has decreased dyesthesias and some improvement in sensation in the leg by light touch. Although a Tinel's sign is discernable below the popliteal fossa, no significant change in motor function has been detected at this time. Unfortunately, long-term follow-up on the patient has not been possible and the patient has not returned for his appointments. The mechanism of peripheral nerve injuries can be determine by careful history, clinical findings and electrodiagnostic studies. Nerve transection is characterized by immediate symptoms and signs of neuropathy. However nerve injuries due to compression, vibration, stretch, strain or ischemia can be more difficult to detect because clinical finding are often elusive or subtle. Symptoms and signs of compressive nerve injury include pain, loss in motor and sensory function, Tinel's sign (sensation of tingling felt with percussion over injured nerve), Phalen's sign and changes in electrodiagnostic studies. The diagnosis of common peroneal nerve compression is based on a careful history and physical examination in conjunction with electro-diagnostic studies to localize level of compression. Patients with common peroneal compression present with impairment of dorsiflexion and eversion of the foot. On physical examination, one may find wasting of the muscles of the anterolateral compartment of the leg and of the extensor digitorum brevis. These patients may have a slapping gait, characteristic of paralysis of common peroneal nerve. When associated with trauma or surgery, the rate of onset of symptoms can differentiate the exact cause of the neuropathy. Acute onset neuropathy is probably related to direct nerve injury or extrinsic compression due to hematoma or compartment syndrome. Although common peroneal nerve can be injured by a variety of mechanisms, entrapment is relatively unusual. Peroneal nerve compression carries a good prognosis for spontaneous recovery, depending on the total length of time of compression. A reduction in motor conduction velocity and in the number of motor units under voluntary control roughly parallels the severity of the lesion. Surgical exploration should be undertaken early if the lesion is complete and if there is reason to suspect discontinuity. Early exploration should not be performed when eletro-diagositc studies show only mild disability. Patients with mild disability should guard against inversion injuries and foot drop by wearing a light foot-drop splint inside the shoe. Exploration is reserved for those patients with progressive symptoms. Compressive neuropathy of the tibial nerve proximal to the ankle is rare. In the popliteal fossa, compression of this nerve may occur as a result of vascular malformations, lipoma, hematoma or Baker's cyst. Deep to the soleus muscle, Volkmann's ischemic contracture may be a rare cause of compression. Compression of the tibial nerve in the popliteal fossa produces pain in the calf muscles and a variable degree of weakness in plantar flexion and adduction of the foot and toes. Sensory deficits may be seen in distribution of sural, lateral plantar and calcaneal nerves. Electro-diagnostic studies are useful for determining the level of the lesion based on the involvement of the gastrocnemius and soleus and well as lack of involvement of the sural nerve. Our case is unusual in many respects. It involves a progressive compressive neuropathy of both the peroneal and tibial nerves. Electro-diagnostics studies and physical finding localized the compressive neuropathy to the popliteal fossa. Exploration of this area found dense scar tissue and bands compressing the tibial and common peroneal nerves. The electro-diagnostic studies and history also suggest a sub-acute process, suggesting that the compression was caused by the formation of scar tissue over the period of several months. This unusual scar tissue formation may be the consequence of hematoma formation, local ischemia, or local trauma from original surgery or accident. Two cases of injury to tibial and peroneal nerves due to hemorrhage in the popliteal fossa was reported by Logigian et al.6 In those cases hematoma in the popliteal fossa was proposed to cause injury by compression from the hematoma and/or by ischemia, which could also explain the neuropathy in our case. There have been other reported cases of both tibial and peroneal compressive neuropathies in the literature. Venna et al2, described a child with both tibial and peroneal compression neuropathy due to entrapment. As with our case, symptoms improved after surgery, but the child had persistent sensorimotor deficits and a foot deformity. Sograard3 described a similar condition of band compression that may have formed as a result of posttraumatic hematoma. The timing of nerve injury repair depends on the nature of injury. The best results are obtained with sharp transections, which should be repaired immediately. The distal segment will respond to electrical stimulation within the first 72 hours after injury. With crushed, avulsion or blast injuries not in continuity, nerve ends should be marked and delayed repair performed in 3 weeks. With closed nerve injuries, nerve conduction studies and electromyography should be preformed within the first 1-3 weeks. Studies should be repeated in first 4-6 weeks, if there is no recovery, surgery should be performed. If there is partial recovery, monthly electrodiagnostics tests and clinical assessments show be performed to document recovery. The upper time limit to repair nerves after injury depends on the time since injury and the length of the nerve. Assuming intact endoneurium, proximal nerve fibers will regenerate at a rate of 1 inch per month. Recovery depends on the time to regenerate from the injury to the motor end plates plus any delays from injury to surgery. If such time results in prolonged denervation of the motor end-plates receptors, then motor recovery is adversely affected (usually 9-12 months). This case demonstrates that lower extremity trauma can cause compressive neuropathy involving the common peroneal and tibial nerves. This condition, which can be identified by early symptoms of compression that progress or do not improve, must be treated early. These compressive nerve injuries require operative intervention to prevent permanent impairment.